I guess. Of course I may be wrong about that…. Some people who love this drama said that if you just focus on the love story and ignore the rest, this show totally works. First off, GAH! Coming from a storytelling background I just can’t discount over half of a drama. And second, yes, the romance is lovely, I had great hopes for this romance as the story went along, but unfortunately these hopes were dashed during those last 2 episodes. I think what upset me the most in this drama was the wasted potential. This writer(s?) had skills. Skillz with a z even. Hyuga is an amazingly well written character. He’s got layers without being super angsty, he has an intriguing back story which is woven neatly into the plot. He has interesting personality quirks and a growth you can see arc from episode to episode. He is clearly not the person he was at the beginning of the drama as he was at the end. The writers wrote the heck out of him. They weren’t afraid to keep putting him in increasingly difficult and character testing situations. They took what he thought he knew about himself, yanked that away from him, let him adjust to his new knowledge of himself just before ripping that carpet from beneath his feet again. THIS is exactly how you write a character and what you do with him when you have him. When we first meet him as the god of all things computer and arrogance and we get the first inklings of Asahina’s upcoming treachery, I looked forward to Hyuga being forced to leave the company, starting from scratch, and rising to the top once again bigger and better this time, not needing to lean on anyone (except maybe our heroine). So why, WHY if they clearly had these skills did they not share them with the rest of the class? Don’t get me wrong. I liked Makoto. I’m really letting those last 2 episodes color the rest of the show for me. Throughout the drama, there were flairs of good writing, good character, until they flip-flopped her over in service of the plot. She may have been weak on the outside, but inside, Makoto had a strong backbone. She didn’t hesitate to put Hyuga into his place when need be. My favorite scenes were where when she stood up to him, like when they met at the interview, or when she was telling him off over the shoes. Almost everyone else in his life were yes men (or women) constantly agreeing with him, or telling him whatever they thought he wanted to hear. She told him what he actually needed to hear and this was instrumental to his change. Her down to earth and practical nature is just the sort of grounding he needed. Not only did Makoto have a strong will, she wouldn’t give up. Next Innovation gets kicked off the project, she goes back to that woman again and again with facts and information in order to get them back on, even after she’s been fired. I even liked Makoto’s practical view about her feelings for Hyuga. She was very matter of fact knowing that she wasn’t going to end up with him. He needed (she thought) to be with someone like Yoko. Of course someone that wonderful and fabulous wouldn’t choose someone ordinary like her. So she simply dealt with her feelings herself and continued to help him with along his path. Yes, she was wrong, but I think that thinking itself was part of the allure for him. So, yes, I can understand why people love this romance. If that were it, I would have too. What happened? The writers failed her. The writers wrote her one way (a pretty awesome way) but then twisted her again and again and the parts just didn’t fit. She’s in grad school right? But she’s dumb? Everybody thinks she’s dumb? She thinks she’s dumb? Um she’s a mother flippin’ scientist. There has to be some smarts underneath that hair. Lots of them. No, she doesn’t know about computers, but that doesn’t make her an idiot. Unless I’m an idiot too. In the end she decides to be a scientist? ACK. It. Just. Doesn’t. Fit. She wants to be useful? Okay, she’s useful to him. Yes, she’s already taught him to be more relatable to people, but that wasn’t the only the she’s done. She was useful to that company. She was like the everyman grounding all the genius airheads around her. What the company was doing was useful. Okay, so she wanted something for herself. I can get that. However, then throughout the story the writers should have layered this aspect of her personality into the storyline. NOT just dumped it in at the end. (I had the same issue with Coffee Prince.) They should have written in there that she actually liked being a biologist (or whatever it was she was actually doing in the lab) instead we were shown, time and again, that lab work bored her. That she wasn’t happy there. That she just did the job to have a job. I was having problems with the show up until this point, but mainly they were all about Asahina, who I just realized I haven’t even touched on yet, but as soon as she took the job and started ducking Hyuga’s calls just as their relationship was starting? I got angry. Hulk-like angry. Why would they do that to this awesome couple? Why wouldn’t she just TALK to him? This, to me. is him clearly staking his claim. She agrees, so now they are a couple, or the beginnings of a couple. Yes, it’s guy speak, but it’s also realistic. Guys don’t speak the same language we do, but that doesn’t mean the feeling isn’t there and there’s no inkling of it. Not to mention the fact that she’d made such a big deal about starting the company with him, being there for him, taking the picture of the start of their new venture. But one more episode in and you decide to abruptly pack it in because Hyuga is starting to learn the art of understanding others? There goes that hulk thing of mine again! The whole thing just felt so contrived and fake. It didn’t flow well with the rest of the drama as if the writer needed to find some reason to break them up just so that they could have that airport reunion at the end. And this show–those characters deserved more. Of course my other problem with the ending? Hyuga going back to Next Innovation purely so that Asahina would have a place to go back to when he got out of jail. What the what? Yep, that was a hair pulling moment. It ties into all the problems I had with Asahina, and how I’m not nearly willing to forgive and forget as characters are in Asian dramas. Hyuga was chased out of that company. The higher ups, who were more than happy to hold out their hands when he had previously made them money hand over fist, were almost gleeful with his downfall. His staff abandoned him. Part of me wanted me wanted him to leave them hanging there. Or go back lording his victory over Asahina. Instead he runs back not for the company itself but for Asahina? His supposed better than a bestie, the man he trusted over anyone, who not only stabbed him in the back but then proceeded to do a little dance during the process? It makes the time we spent watching him create the other company a waste. (Especially considering how Makoto abandoned it just as quickly). Of course most of my ire is mainly because Asahina was a TERRIBLY written character. What happened? Hyuga is layered, complex, interesting. Makoto was fairly well written. Yoko, although we don’t know as much about her as the other characters, also had some layers or at least was consistent. Asahina? All over the place. It was as if the writers couldn’t decide where they wanted to go with him. From episode to episode he flipped and flopped goals and motivations. At the beginning, he clearly enjoyed his job, took great joy in working with Hyuga and was fascinated with how his mind worked. Okay. Cool. Then, suddenly he’s got sinister undertones. They try to explain this away with jealousy, which I could totally buy, if they’d just followed through with it. Then, he’s mid-evil scheme to take the business away from Hyuga. Did it ever occur to him that Hyuga was the company? That the reason it was so innovative and successful was Hyuga’s brain? No? Well, the rest of us knew that. It was pretty obvious right from the first episodes. Just as I knew Asahina would force Hyuga out of the company, I also knew that Asahina would crash and burn and the company would regret their decision. It was cringe worthy watching him during some of his bwahahahaha, “I’m an evil schemer” scenes. When he told Hyuga he started the company with him knowing that he was going to take it away from him? The whole scene overdone and I just didn’t buy it. For a while I was wondering, “Is he actually trying to push him out so Hyuga will go out and learn that he can be awesome and build an even awesome-er company all on his own?” Like Asahina was teaching Hyuga a life lesson? The downfall of Asahina was way too fast. He no more than pushed Hyuga out than his scheme was uncovered and he was ousted. I would have liked to have seen a slower downfall, him realizing that he couldn’t do what Hyuga did, rather than him being taken out by the stock manipulation. His lesson wasn’t complete. I feel like perhaps this show needed a few more episodes. They had the bones of a good story, a great love story, and some solid characters but in an effort to shorthand the series into 11 forty-five minute episodes, a lot of good plot and character development was sacrificed. Hmm… This may be the first time I’ve complained a show was too short. There was just so many interesting things that weren’t tapped into. The dynamic between Asahina and Yoko for instance. I liked the parallel of the siblings, one who had no problem cheating and manipulating and the other who had to decide just what she was willing to do in order to get what she wanted. The previous worker/partner, who in this version of the drama was simply a plot device. And of course, I would love to have more scenes with the 3 project developers. The three were just a hoot to watch, especially the one who kept trying to get Hyuga to remember his name. See? Even without the romance, there is potentially lots of good stuff here. This is the drama that I want to see. 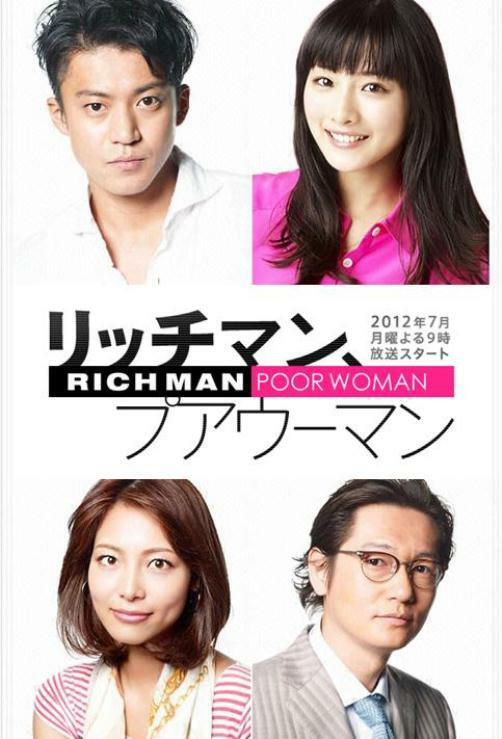 So will I watch Rich Man, Poor Woman again? Hmm… Hard to say. I was pretty upset by the last couple of episodes, so I’d go with no, but even with doing a quick run through to get screen shots, I was reminded that there was a lot of good in this drama. Will I recommend this to others? See answer to previous question.